(Nanowerk News) A catalyst being developed by researchers at the Department of Energy's Oak Ridge National Laboratory could overcome one of the key obstacles still preventing automobile engines from running more cleanly and efficiently. The mixed oxide catalyst could solve the longstanding problem of inhibition, in which nitrogen oxides, carbon monoxide and hydrocarbons effectively clog the catalyst designed to cleanse a vehicle's exhaust stream. This happens as these three pollutants compete for active surface sites on the catalyst. Now, however, ORNL's low-cost catalyst composed of copper oxide, cobalt oxide and cerium oxide shows considerable promise when tested in simulated exhaust streams. "Our catalyst potentially fixes the inhibition problem without precious metals and could help more efficient engines meet upcoming stricter emission regulations," said Todd Toops of ORNL's Energy and Transportation Sciences Division. 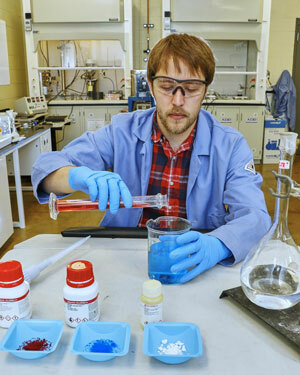 Toops noted that the unique formulation builds on previous work by colleagues Andrew Binder and Sheng Dai, who varied the composition of the three catalyst components in search of improved oxidation activity under simple conditions. Researchers also emphasized that the lower exhaust temperatures associated with efficiency gains pose additional challenges because conventional catalysts perform more efficiently at high temperatures. Hydrocarbons - and there are hundreds of species - pose perhaps the biggest challenge. "As we make engines more efficient, less wasted heat exits the engine into the exhaust system where catalysts clean up the pollutant emissions," said Jim Parks, a member of the Energy and Transportation Sciences Division. "The lower temperatures in the exhaust from the more efficient engines are lower than the typical operating range of catalysts, so we need innovations like this catalyst to lower the operating range and control the engine pollutants." This finding, published in the journal Angewandte Chemie ("Low Temperature CO Oxidation over a Ternary Oxide Catalyst with High Resistance to Hydrocarbon Inhibition"), is encouraging, the authors note, as "vehicles with internal combustion engines will likely remain a dominant fraction of the light-duty fleet in both hybrid and conventional drivetrains." Binder, Toops, Parks and Dai performed extensive tests using different ratios of copper oxide, cobalt oxide and ceria to determine the optimum ratio, which was initially evaluated at an atomic ratio of 1:5:5, respectively. Next, researchers will determine scalability of this approach and perform cost-benefit analyses.